We’ve all heard stories of high-flying corporate whizzes leaving cushy jobs for the pursuit of passion. Victoria Martin-Tay is living proof. 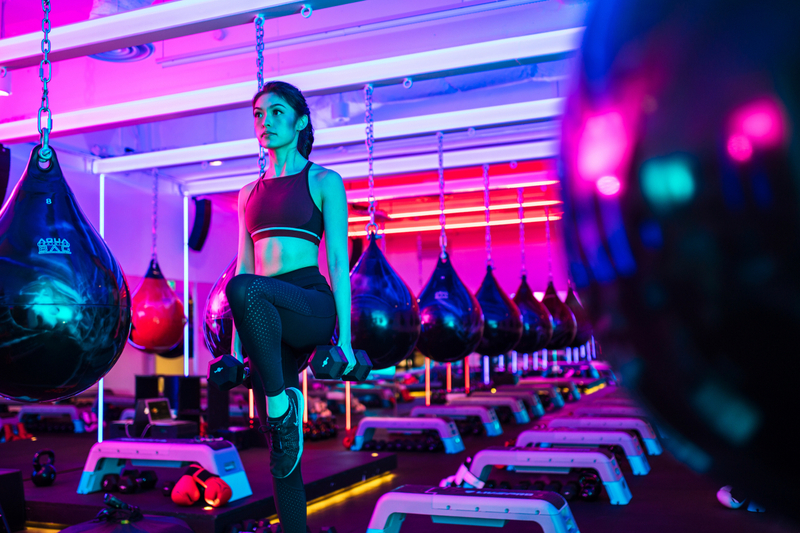 The co-owner of Boom, a buzzing boutique boxing gym in Singapore’s CBD, is an Ivy League graduate who swapped engineering for fitness. Victoria runs Boom with her husband, Bryan Tay, and is one of the most hands-on gym owners you could ever meet. Knee-deep in operations, she juggles teaching with working front of house and spearheading the gym’s growth. Surprisingly, Victoria hasn’t always been the fitness guru she is today. She tells us how she fell in love with exercise and got into the business of making others feel good. How did you fall in love with fitness? I was averse to exercise most of my childhood and only started my fitness journey when I moved to the United States for college. Most of my friends at that time saw being active as a stabilising force in their daily lives and could not fathom why I did not work out at all. One of my best friends urged me to start taking strolls in the beautiful fall weather. A stroll became a jog and eventually turned into a run. Before I knew it, I was running half marathons. Moving back to Singapore and adjusting to running in a much warmer, urban environment was not easy and I turned to boutique gyms to find my next new passion. I ended up falling in love with indoor cycling and decided I wanted to become a part-time fitness instructor on top of my full-time job. You were a cycling instructor at CruCycle for a few years. What inspired you to start Boom? After three years of teaching spin, during which Bryan and I had sacrificed time with each other as well as family and friends, many people encouraged us to start our own gym. We realised opening Boom seemed like the natural progression for our passion — we loved teaching and derived a greater sense of joy connecting with our customers than from our full time jobs. We wanted to start Boom to focus on the importance of being strong. We are not talking about Arnold-Schwarzenegger type of strength but functional strength instead — this makes the tedious daily chores so much easier to manage such as running after children, lifting up a carry-on to the overhead bin and carrying shopping bags. Describe your fitness routine and your diet. Between teaching and running a business, I am on my feet all the time, which keeps me incredibly active, as evidenced by my FitBit step count. Unfortunately, I also have less time to dedicate to my personal workouts — that’s limited to only twice or thrice a week. We joke all the time that cleaning the studio helps to keep us in shape. I used to work at a desk all day and exercise for 50 minutes five to seven times a week. Now, I’m on my feet for a large part of the day, and only can only sneak in a couple of 30- to 40-minute long workouts a week. My physique then and now isn’t that much different, except that I have gotten even more toned with less working out. I attribute that to a significant shift from cardio intensive workouts to more strength-based exercises. As for my diet, I always tell people I cannot be a role model for a healthy balanced diet. I’m your typical indulgent everything-probably-does-taste-better-with-lard Singaporean foodie. Give us the real deal. What’s a fitness myth you’d like to bust? People like to think they have to do hour-long cardio workouts many times a week to lose weight. I think this is foolish for so many reasons because your body plateaus from these cardio workouts so quickly. Cardio alone is not the most effective way to workout or maximise total calorie burn. Lastly, not many of us have the time for hour-long workouts so frequently every week. A more effective solution would be pairing twenty minutes of strength training with twenty minutes of effective, interval cardio. This is more sustainable in the long term for fat burn, as well as cardiovascular and muscular strength. Do you ever tire of working out? Yes, I get tired from working out, and also being constantly active and involved in running the business. But now I know not to overdo it. Having gone through health scares a year ago reminded me that working out should help me and not harm me. Understanding one’s body and limits is crucial. My body is not capable of always functioning at its best if I don’t have sufficient rest. Over the last three years of teaching, I’ve been at my fitness prime, but it was also the sickest three years of my entire life — imagine the paradox! I came down with colds and flus much more than I used to in grade school and each time I fell ill, I was sick for a long time. My body was working on overdrive to keep itself fit. I attempt cooking and baking with my husband. It’s a way for us to work together in a much less stressful environment. In line with being active but also unwinding at the same time, we’ll often take a stroll around our neighbourhood or drive to Botanic Gardens to walk around. A good massage also works wonders for us mentally and physically. Speaking of massages, tell us your favourite spa or wellness resort. My husband and I are partial towards the Ritz Carlton brand as we got married at the Ritz Carlton Hotel in Singapore. For our honeymoon we stayed at the Ritz Carlton Waikiki Beach in Hawaii, which is notably my favourite wellness destination. Come on, it’s Hawaii, how can you not be relaxed? Without venturing too far from home, I would also say the Auriga Spa at Capella is fantastic. Find your balance. Too much of a good thing can be a bad thing, and not enough of one can leave you unfulfilled. Balance often unlocks our hearts and minds to receive happiness and inner peace. Can you share five personal wellness tips for women who struggle to keep up with their fitness routines? When you’re starting out, consistency is key. You don’t have to jump into working out five times a week, every week. Start with twice or thrice, but do it consistently and weekly. Workout smart. Look for shorter workouts that incorporate both strength training and cardio. Don’t be afraid of weights. You don’t have to go super heavy like a body builder, but you should pick up weights that challenge your muscles a little. If you don’t feel any soreness in the days following your workout, the weights you’ve used are not heavy enough. Incorporating weight training into your workout helps to eventually reduce your body’s fat layer as your muscle layer becomes more defined. This eventuality combined with your consistency will give you results. Diet is crucial. I can’t say I keep to a very healthy diet but I find that when I eat terribly, I’m sluggish, and feel heavier and find it even more difficult to drag myself to a workout. I find myself sleepy all the time, and just wanting to eat more. Sometimes your diet affects your physical willingness to workout. This is more a warning than a tip, and it’s one my mother used to remind me of. Make it a habit, before it’s too late, before you have to start doing it because of health concerns. By then, sometimes, it may be too late, and some things are harder to reverse.